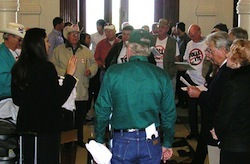 A joint effort for Tax-Day at the Capitol in Austin. Come help us along with like-minded grass-roots groups from across the state of Texas. Your freedom to travel is at risk! 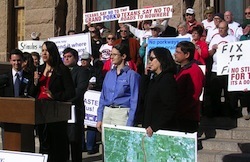 Concerned citizens from across the state will gather in Austin to interact with lawmakers on transportation-related issues. We’ve seen a massive increase in our cost to drive through tolls, handing control of our public roads to private foreign corporations, and unsustainable debt sweep the state, with more to come unless we make our voices heard. This is a day when CITIZEN lobbyists come to the Capitol to advocate on what matters to grassroots Texans — like getting an affordable, pro-taxpayer transportation policy in place. The public parking garage east of the Capitol is at 12th Street and San Jacinto. If that garage is full another is located north of the Capitol at 18th Street and Congress at the Texas History Museum. Parking costs $10-12/day. Bring money for lunch. We plan to eat together on the South Capitol lawn. For a box lunch from Jason’s Deli, the cost is $12.07. We need your order by Thursday, April 6 to reserve your lunch. No orders will be taken on site. You must order in advance. Otherwise plan on getting lunch in the Capitol Grill (wait times in the food lines can exceed 30 minutes). Bring a notebook to take notes (optional). Fliers, maps and materials supplied by TURF. T-shirts with our message are available for $15. Please order your t-shirt by Sunday, March 26. We need a HUGE crowd to show up to talk to legislators about transportation. There are already some very bad proposals being pushed by special interests (more tolls in the hands of private corporations), and without a grassroots revolt, it’ll sail through without a whimper of opposition. Plan to come and have others join you. contact Terri Hall or call (210) 275-0640. A 3 minute montage of what is wrong with transportation decision making. This Metropolitan Planning Organization (MPO) is the one that controls the Alamo Area funding. There are 24 other MPOs across the state of Texas.